The simple act of grilling flavoured meats and serving together with bread and fresh salad is a well loved cooking tradition. 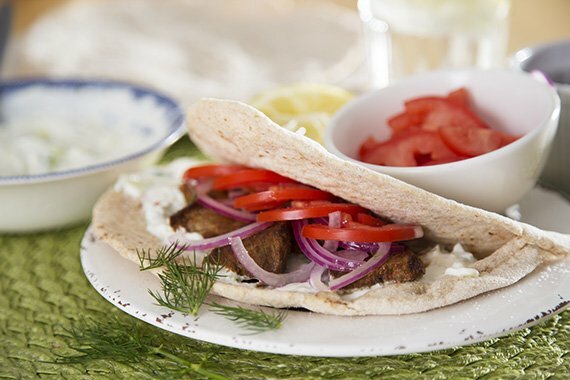 In Greece this is called a “gyro” and it’s traditionally wrapped in a warm and slightly thick pita. This recipe also uses local onion and aromatic dill to create a delicious salad. Don't forget to share the moment #youplateit with us on Instagram and Facebook - we love to share your triumph. Preheat oven to 200°C. Wash the fresh produce. Pat dry steak with paper towel, then cut against the grain into ½ cm slices. Peel red onion and thinly slice. Break up lettuce leaves and roughly tear. Thinly slice tomato. Halve lemon. Roughly tear dill leaves, discarding stems. Peel and mince garlic. Shred cucumber on large holes of a box grater or finely dice. (Tip: If shredding cucumber, gently squeeze in paper towels to remove excess moisture. Alternatively, you can scrape the seeds out prior to grating). Season steak on both sides with spice mix, salt, and pepper. (If you prefer to cook the red onion, add ½ tsp olive oil in a large pan, lightly grill, then set aside to cool in a bowl). Heat olive oil in a pan over medium-high heat. When oil is shimmering, add steak and cook 2-3 minutes before flipping. Flip 3 times for a total cooking time of 10-12 minutes (or to your preferred doneness). Remove from pan and set aside to rest for about 5 minutes. (TIP: we supply our meat as a thick-cut piece, as we think it cooks much better as a bigger piece. You can always cut into thinner steaks if preferred, but bear in mind you will have to keep a closer eye on it to reach your desired doneness). While steak cooks, in a medium bowl, stir together yoghurt, garlic, and cucumber. Taste and add salt and pepper as needed. Set aside. Add a squeeze of lemon juice to taste. In the medium bowl with red onion (if grilled in step 2), add as much lemon juice as you'd like, dill, and ½ tablespoon olive oil to the red onion. Place pitas on a lined baking tray and add to the oven. Toast 2 to 3 minutes, or until lightly browned and warmed through. Remove from the oven. Divide pitas evenly between plates. Top with yoghurt sauce. Add steak, lettuce, then onion salad. Finish with tomato and serve. Enjoy!